I intend to make a sweet potato casserole for Christmas and I couldn't help but wonder if there were any health benefits attributed to these sweet, orange-colored potatoes. I did a little research and here is what I found. These taters are on top of the list where nutritional value is concerned. They are loaded with antioxidants, calcium, potassium, manganese, vitamins A, B6, and C, dietary fiber and iron. Be careful though, because they are also high in sodium: 24 mg per serving. Due to the high amount of antioxidants, sweet potatoes may prevent several different types of cancer. They also lower the risks brought on by heavy metals and oxygen radicals, and their anti-inflammatory abilities lower and can cure internal and external inflammations. In studies, the latter has shown to prevent rheumatoid arthritis and significantly reduce the risk of other forms of arthritis. Applying raw potato on the inflamed area will help too and is a great cure for other infections, boils, burns, and sore eyes. It is said that the sweet potato assists the body in stabilizing and lowering blood sugar levels and cholesterol, heals stomach ulcers, prevents constipation, acidity, emphysema and other lung diseases, promotes a healthy digestive system, and gets rid of heavy metals in the body. Although there is insufficient evidence, raw potato juice is mentioned as a cure for stomach disorders and water retention. Eating potatoes also controls and limits your appetite which is great for loosing weight. There are a few warnings though: ensure to use ripe, unblemished potatoes, otherwise you could end up with a headache, nausea, vomiting, diarrhea, stomach pain, thirst, restlessness, or worse. Those suffering from diabetes would do well to keep a close eye on their potato consumption since they can have an affect on your blood sugar levels. Those taking thrombolytic medications need to be aware as well; the interaction could cause bleeding and/or bruising. All in all, this nutritional delicacy has many health benefits. It will definitely appear on our dinner table in one form or another and we will thank God for the abundance of blessings He gives us. He makes sure those are on our daily menu! 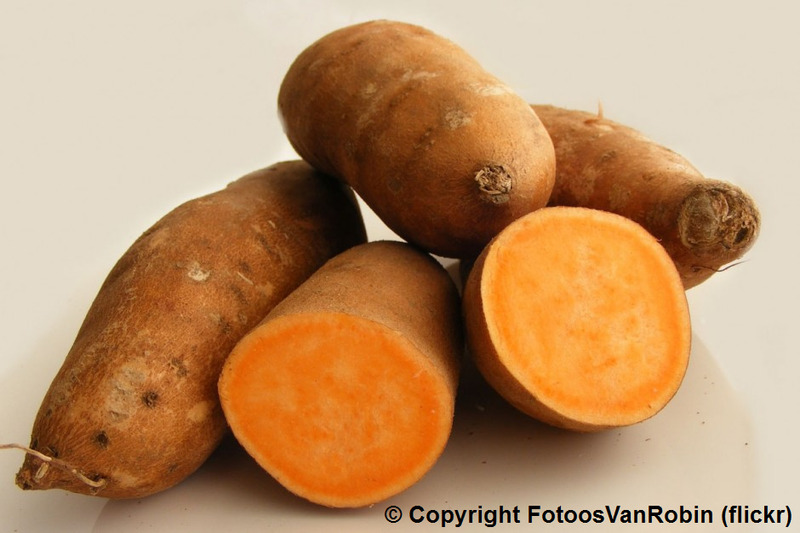 Hi Lieve Zus :) During the two world wars, many Asians survived on sweet potatoes only. Thus, the older generation prefer to eat this less now as rice and other food products are easily available after the war. That's understandable, but too bad since they are so good for you. I had never heard of nor eaten sweet potatoes since they were not available in the Netherlands where I grew up. I love them though. Sweet potato casserole is sooooo yummy. No, it is not helping our uh oh topic with all that brown sugar on top. Grin. Thanks lieve zus. I only use the sweet potatoes for casserole, but I may try them that way. I use that method with regular potatoes. Try mashing them and adding some bacon bits. Yummy!